Memphis loves these "38104 shirts" and you will too. They're all cotton, printed in Memphis, and a great way to show your pride in the 38104 zip code. 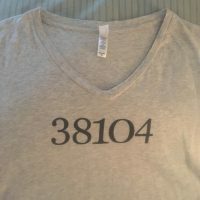 38104 T-shirts make great gifts!